Daniel, C., van Hoof, H., Peters, J., Neumann, G.
Rothkegel, L. O. M., Trukenbrod, H. A., Schütt, H. H., Wichmann, F. A., Engbert, R.
Wallis, T. S. A., Bethge, M., Wichmann, F. A.
Daniel, C., Neumann, G., Kroemer, O., Peters, J.
Schütt, H. H., Harmeling, S., Macke, J. H., Wichmann, F. A.
Peters, J., Bühlmann, P., Meinshausen, N.
Rueckert, E., Camernik, J., Peters, J., Babic, J.
Jäkel, F., Singh, M., Wichmann, F. A., Herzog, M. H.
Mohr, J., Seyfarth, J., Lueschow, A., Weber, J. E., Wichmann, F. A., Obermayer, K.
Rueckert, E., Kappel, D., Tanneberg, D., Pecevski, D., Peters, J.
Bayesian inference and bounded rational decision-making require the accumulation of evidence or utility, respectively, to transform a prior belief or strategy into a posterior probability distribution over hypotheses or actions. Crucially, this process cannot be simply realized by independent integrators, since the different hypotheses and actions also compete with each other. In continuous time, this competitive integration process can be described by a special case of the replicator equation. Here we investigate simple analog electric circuits that implement the underlying differential equation under the constraint that we only permit a limited set of building blocks that we regard as biologically interpretable, such as capacitors, resistors, voltage-dependent conductances and voltage- or current-controlled current and voltage sources. The appeal of these circuits is that they intrinsically perform normalization without requiring an explicit divisive normalization. 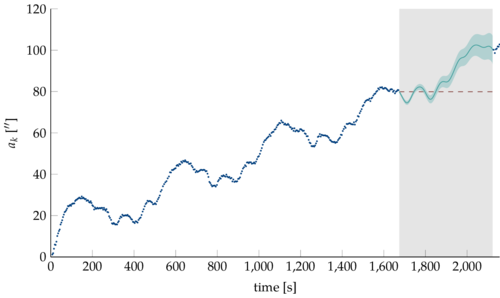 However, even in idealized simulations, we find that these circuits are very sensitive to internal noise as they accumulate error over time. We discuss in how far neural circuits could implement these operations that might provide a generic competitive principle underlying both perception and action.